Planetary nomenclature, like terrestrial nomenclature, is used to uniquely identify a feature on the surface of a planet or satellite so that the feature can be easily located, described, and discussed (Hargitai 2011). The IAU has been the authority of planetary and satellite nomenclature since its first organizational meeting in Brussels in 1919. The first goals were to normalize various systems used in lunar and Martian nomenclatures across different countries. The IAU appointed Mary Blagg and several other astronomers to the newly commissioned nomenclature committee, chaired by H. H. Turner. The report of this committee, "Named Lunar Formations" was the first systematic listing of lunar nomenclature (Blagg 1935). Following this first listing, several more publications – including catalogs for Mars – followed. In the 1960’s, as detailed remotely sensed images became available, the need of a single planetary gazetteer of official names became critical for effective scientific communication. The names used within the gazetteer come from cultures all over the world and generally follow a theme for a feature type and body. For example, on Mars, larger craters are named after deceased scientists, especially those who have contributed significantly to the study of Mars; writers and others who have contributed to the lore of Mars. For Mercury, large valleys are named after abandoned cities (or towns or settlements) of antiquity. The current nomenclature database is managed by the Astrogeology Science Center on behalf of the IAU (website: http://planetarynames.wr.usgs.gov/). Maps for digital or hard-copy distribution can be critically compared using internationally adopted nomenclature. As such, it is advised that such maps display appropriate nomenclature completely and accurately when possible using the map’s defined scale. Blagg, M.A., Müller, K. (1935) Named lunar formations. International Astronomical Union, Percy Lund, Humphries and Co Ltd, 196 p. London. Hargitai, H., Shingareva, K.B. (2011) Planetary Nomenclature: a Representation of Human Culture and Alien Landscapes. Advances in Cartography and Giscience. Lecture Notes in Geoinformation and Cartography, 6, (4), pp. 275–288 doi:10.1007/978-3-642-19214-2 18. This gazetteer contains detailed information about all names of topographic and albedo features on planets and satellites (and some planetary ring and ring-gap systems) that the International Astronomical Union (IAU) has named and approved from its founding in 1919 through the present time. This edition of the Gazetteer of Planetary Nomenclature supersedes earlier informal volumes distributed by the U.S. Geological Survey (USGS) in 1986 as Open-File Report 84-692 (Masursky, Harold and others, 1986), and in 1994 as U.S. Geological Survey Bulletin 2129 (Batson and Russell, editors). 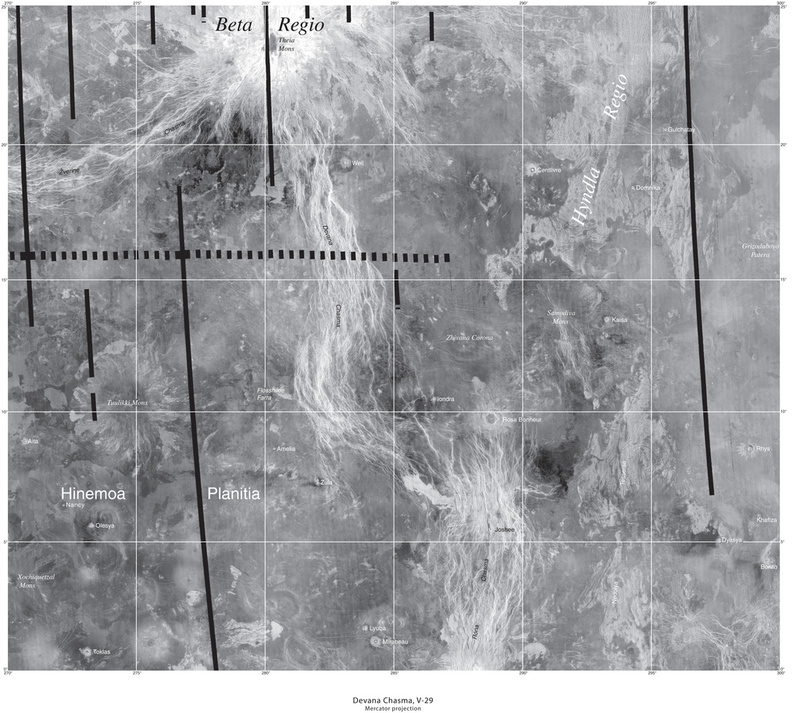 Named features are depicted on maps of the Moon published first by the U.S. Defense Mapping Agency (DMA) or the Aeronautical Chart and Information Center (ACIC) and more recently by the USGS; on maps of Mercury, Venus, Mars, and the satellites of Jupiter, Saturn, and Uranus published by the USGS; and on maps of the Moon, Venus, and Mars produced by the U.S.S.R.